This slot is still played all over England, in places like the Empire Casino in London or the Rendevouz in Brighton. Novoline software has adapted both for online play, so that players can recreate the experience of the original slots and have fun in the process. Click here to play Book of Ra now, or read this review to find out more. 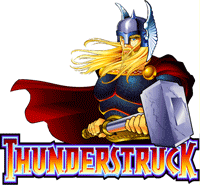 The online version features all the original sounds and icons found in the physical version. You get the sculpture, the scarab, the adventurer, and the book, along with 10, J, Q, K and A. The rest of the interface features the same vibrant colors as the original, with the paylines shown at the side of the slot. At the bottom, all the essentials are shown, such as bet-per-line, your credits on the left-hand side, number of lines played, and a paytable showing you the winning symbols and the payout in detail. The standard version has 9 paylines, differing from the deluxe version which has 10. 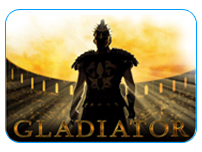 The player can choose how many lines to play, and how much to bet on each line. The minimum bet per line is £0.02, while the maximum is £5, resulting in a maximum overall wager of 45 pounds. 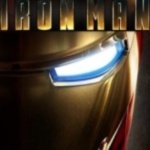 Players can hit autoplay and choose the number of rounds to run automatically. The maximum number of rounds on autoplay is 50. The maximum payout is £250,000, with a quite high theoretical return-to-player of 96.99%. In order to ensure your minimum win, you have to get the three symbols across any of the lines. The symbols with a higher payout are the adventurer, paying £20 for every £1.80, and the sarcophagus, which pays £8 instead. If you manage to match five adventurer figures, the payout is £1000 for every £1.80 played, while matching five books across any line pays £360 for every £1.80. Jackpots are not progressive for this slot. 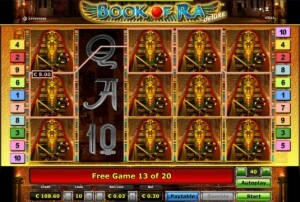 The Book of Ra features quite a few bonuses, including 10 free spins by matching 3 wild symbols across a line. The book is a scatter symbol, and counts as any symbol except for specials. This slot also features a gamble option, but there are no options to nudge or hold. The gamble game is based on red or black, and you just need to choose which color will come up next. 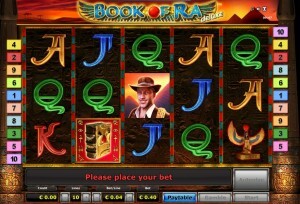 Overall, a great interface, great sounds and good theoretical RTP, make the Book of Ra a popular favorite in online casinos.